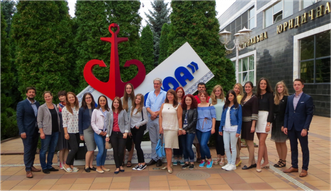 The Summer School was conducted at the National University "Odessa Law Academy” in cooperation with the University of Osnabrück. Project team: Prof. Dr. Ulrich Schneckener, Sebastian Schäffer, Iris Rehklau. The project was funded by the DAAD. The summer school aimed to develop future scenarios for the political and ethnographic development of the region with respect to fragile statehood, minorities and armed conflicts. In the first part, the foundations for the joint work on the project has been laid in an intercultural workshop. In the second part, an overview of the current situation in the post-Soviet area was given. The participants were be informed about the different aspects and challenges of conflict resolution. The regional focus was on the conflicts in Transnistria and Eastern Ukraine. In the third part, future scenarios for the EU-Russia-Relations and the Black Sea Region with focus on Moldova and Ukraine, were developed by the participants under the guidance of the lecturing team.